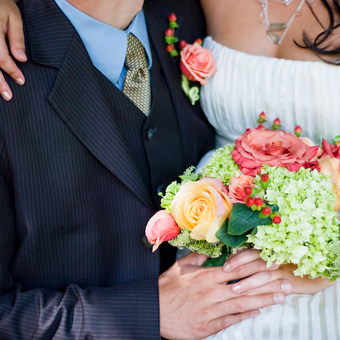 A Green Wedding that saves you green (money)? What if I told you as a flower designer and event planner, my real skill is saving you money as well as the planet? It's the inheritance of working sustainably. It makes perfect sense. Use less materials, less shipping, less new things, and you're going to lower costs somewhere. When I work on an event or project I'm thinking sustainablility. What can I get nearby that will work perfectly for this theme? What could I decorate with that is biodegradable or I can find used? Who is growing those flowers nearby, rather than overseas. Yes, it takes a little more work and a different way of thinking, but once you start viewing the world through the sustainable lens, it becomes very common sense. So here's an example of a wedding I did on a budget. And I didn't skimp on beauty and feeling. The location was perfect. An outside venue in September, wonderful weather for a late summer/early fall day. 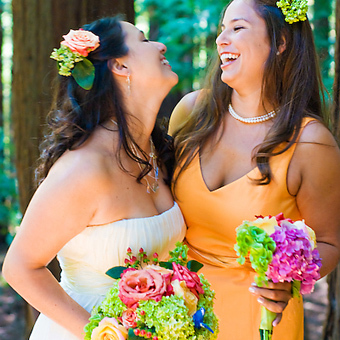 The couple chose to have the ceremony in the redwood grove in the Berkeley Botanical Gardens and the reception outside on a patio near succulents and greenhouses. We had two small areas to decorate, but luckily those areas already came full of beautiful colors and ambiance. 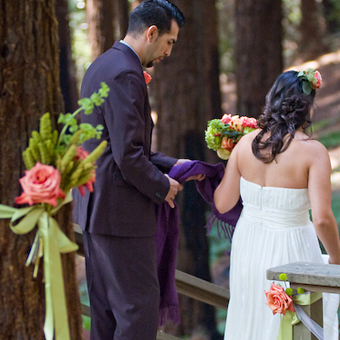 The Redwood grove was so lush and magical, we just added a few special touches here and there to add a romantic and bright feeling. The patio already had large succulents and plants around, so just a few splashes of color did the trick to enhance the atmosphere. We focused on beautiful bouquets that matched the bright bridemaid dresses and a blossoming and bright bouquet to enhance the bride's simple column dress. It turned out beautifully, and the flowers cost under $1,000. Amazing at best. We used organic and fair trade roses and locally grown hydgrangea (I grow myself) as well as locally grown hypericum berries, bells of ireland and amaranthus from flower growers who bring their goods to the local flower markets. They didn't travel far, and I use recycled vegetable oil to power my vehicles, so gasoline usage was at a minimum. 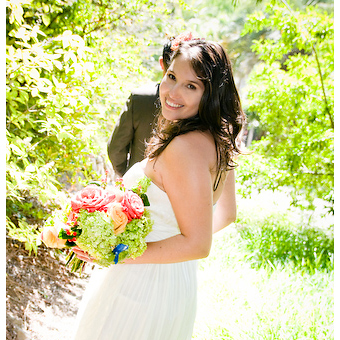 Bright colors and bright smiles, they must know those flowers are organic! Using organic, local and fair trade flowers means less toxic pollution for the special events we enjoy with loved ones and the rest of the world. It also means supporting local businesses and helping small businesses thrive. More people and families are supported, less harm is done to the world around us. All that great energy and care shines through the event, through the flowers, the people and the environment that is taken into consideration. Buy local and organic, think sustainably, care for the world.